Found a fascinating story on The Register (UK) this morning, entitled “Is Windows 10 Ignoring Sysadmins’ network QoS settings?” It explains how an Australian sysadmin observed a sudden drop in Internet connection performance that ties into Windows 10. Specifically, it shows how a Microsoft default setting (see figure below) can impact overall Internet performance especially on networks with narrow-bandwidth connections. In reader comments, ADSL (usually limited to T-1 or fractions thereof, at or under 1.544 Mbps) gets particular mention. For such users a WUDO backfire on narrow WAN pipes seems likely, if not inevitable. 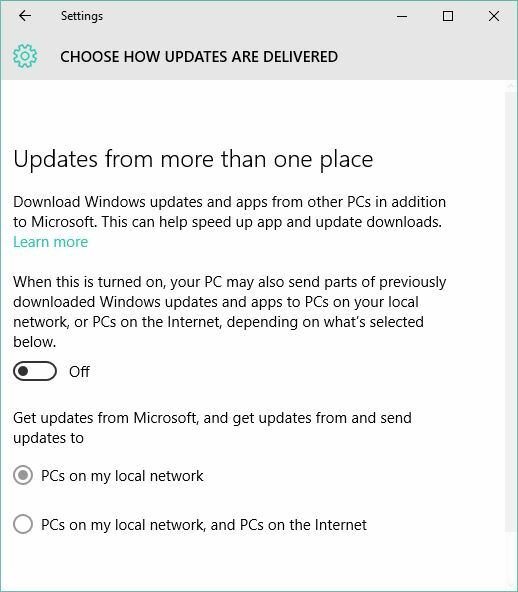 By default, this control is turned on, and the option to get updates from and send updates to both local PCs and the Internet is enabled! Here, it’s turned off, as it properly should be. This update control is called Windows Update Delivery Optimization, aka WUDO. It’s intended to allow Windows users to obtain (and share) updates from sources other than Microsoft’s Windows Update service. Alas, the process of sharing or obtaining updates with other PCs on the Internet may cause a WUDO backfire on narrow WAN pipes. How Does WUDO Backfire on Narrow WAN Pipes? Apparently, the TCP connection used for update transfer can be ill-behaved between sender and receiver when WUDO comes into play. The admin who reported the problem used Wireshark to confirm that network congestion came from large numbers of out-of-order TCP packets. Apparently, connection negotiation failed to downsize packets moving from sender to receiver. Instead of reducing packet size and traffic volumes, it caused added retransmissions and swamped the connection. Fortunately, the fix is easy. Turning off WUDO makes the issue moot. On most networks of scale, this shouldn’t be a problem: internal update mechanisms prevent WUDO from coming into play. But for BYOD user machines, admins would be well-advised to turn it off. Who wants users to get Windows updates from an unknown source? The whole thing is a foulup, if you ask me.